Dr Roz D’Ombraine Hewitt is a psychologist, UKCP registered psychotherapist and accredited psychosexual counsellor with over 20 years experience of working with individuals and couples in the NHS and her private north London practice. In addition to a post-graduate diploma in psychosexual therapy, she has a MSc in humanistic-integrative psychotherapy and an MSc in counselling psychology. 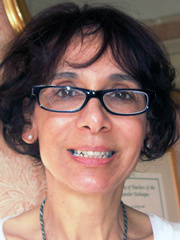 Roz’s early experience of working in a psychiatric hospital inspired her first book, Moving On: A guide to good health and recovery for people with a diagnosis of schizophrenia and later her doctoral research into the impact of psychotherapy on the recovery of women with a diagnosis of severe mental illness. Drawing on her research findings she now facilitates training workshops for mental health charities, including Mind.